Sandy banks, plains, and dunes, often in somewhat disturbed places such as dry roadsides. Common on the jack pine plains and also from Whitefish Point to the Huron Mountains along Lake Superior, where plants are relatively large and showy when blooming late in the summer. Very local in southernmost Michigan. The perianth varies from white to red. Until the plants bloom (chiefly August–September), the peculiar segmented appearance of the immature inflorescences, with closely overlapping ocreolae but no buds yet evident, often arouses curiosity in those not familiar with the species. 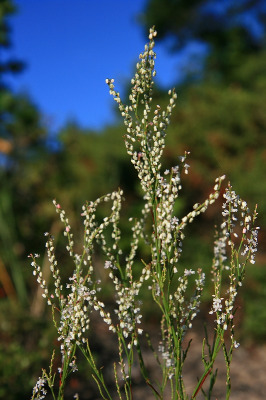 Schuster, Reveal, & Kron (2011) show that this species is nested within the group of Polygonum containing other slender annual species such as P. douglasii and P. tenue. MICHIGAN FLORA ONLINE. A. A. Reznicek, E. G. Voss, & B. S. Walters. February 2011. University of Michigan. Web. April 22, 2019. https://michiganflora.net/species.aspx?id=2293.